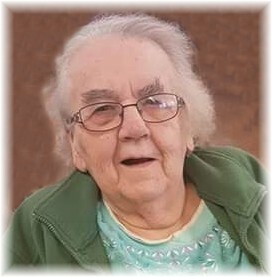 Obituary for Annie (Kozarchuk) Humeniuk | Swan Valley Funeral Services Ltd.
On Monday, March 18, 2019 Ann passed on peacefully, after a short illness, surrounded by family, at 92 years of age. Ann was born November 3, 1926 to William and Dora Kozarchuk (Perchaluk) in the R.M. of Gilbert Plains, Manitoba. She grew up and received her schooling in the Venlaw area. After a short time working in Vancouver, British Columbia, she returned to Manitoba where she met and married Mike Humeniuk of Cowan, Manitoba on July 19, 1947. They farmed a raised a family of four, and retired to Swan River, Manitoba in 1989. Mike passed on in 1995, and in 2009 Ann moved into Rainbow Lodge, and then to the Swan Valley Personal Care Home in 2016. Ann enjoyed gardening, sewing and crafts, and playing bingo. She is survived by her three sons, Morris (Juanita) and Bill (Karen) of Cowan; David (Lorna) of Winnipeg, Manitoba; and daughter Rose Lee (Barry) of Neepawa, Manitoba; nine grandchildren, Jeff, Heather and Dustin Humeniuk; Ken and Kevin Humeniuk; Cheryl (Lee) Beaumont; Mike and Mark Lee and Kaili Humeniuk; and twelve great grandchildren, as well as three sisters, Mary (Mike) Okun of Winnipeg; Helen (Walter) Lysohirka of Thunder Bay, Ontario; and Frances (and the late Morris) Sadowy of St. Albert, Alberta. Ann was predeceased by her husband, Mike (1995); her parents, William and Dora; brothers, John, and Morris; and sister Victoria (all 1952); brother, Mike; and brother, Joe (2007); sister Nellie (2002); and brother Walter (2011). A memorial service will be held on Tuesday, March 26, 2019 at 1:00 p.m. from the Chapel of Swan Valley Funeral Services, Swan River, Manitoba, with Father Warren Dungen officiating. Interment in the Cowan Community Cemetery will take place at a later date. Flowers are graciously declined. If friends so desire, donations in Ann’s memory may be made to: Swan Valley Health Facilities Foundation – Personal Care Home, Box 1450, Swan River, Manitoba R0L 1Z0.